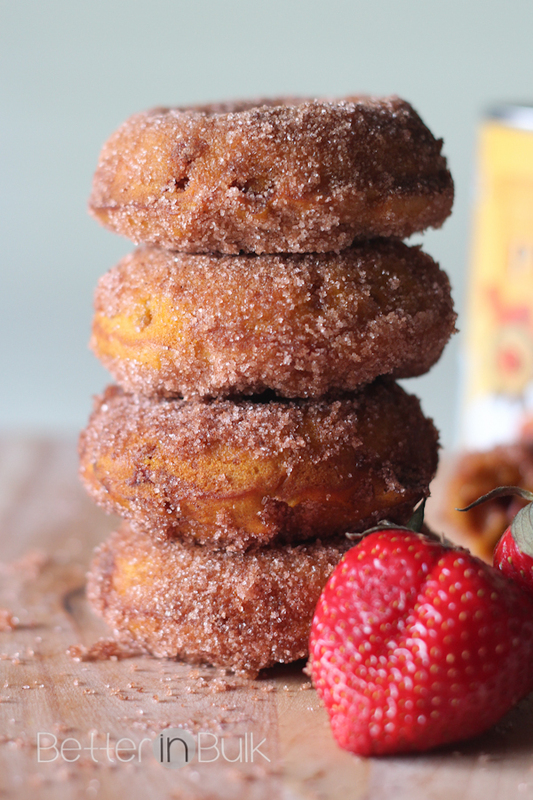 This recipe for pumpkin strawberry doughnuts is brought to you by Libby’s. All opinions are 100% mine. Think pumpkin is just for the Fall and pumpkin pies? Think again! Think pumpkin can't be enjoyed year-round? Pumpkin Can! Not only is pumpkin delicious ANY time of the year (for much more than your typical holiday pie) but pumpkin literally is a superfood that can add both deliciousness and nutritional value to sweet AND savory dishes year-round. I took the Pumpkin Can challenge – are you ready to join me? 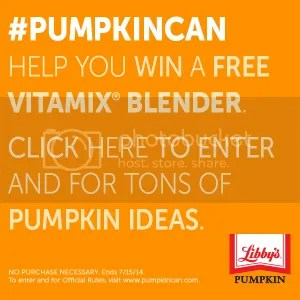 Keep reading below to find out how #PumpkinCan can help you win a Vitamix Blender as well as provide tons of ideas for using pumpkins in your recipes! Tip: Leftover pumpkin can be stored in the freezer so it ready whenever you want it. Just freeze scoops of pumpkin puree in an ice cube tray then "pop" them into a freezer bag for later use. I love baking with Libby’s Pumpkin. In an effort to be creative in the kitchen and think outside the "pumpkin box" I decided to incorporate two favorite flavors – pumpkin and strawberry – into one delicious baked good. Pumpkin is typically eaten in the fall, and strawberry is typically eaten in the summer. How would they taste paired together? The answer? Better than any of us could have ever imagined! Ready for the recipe? 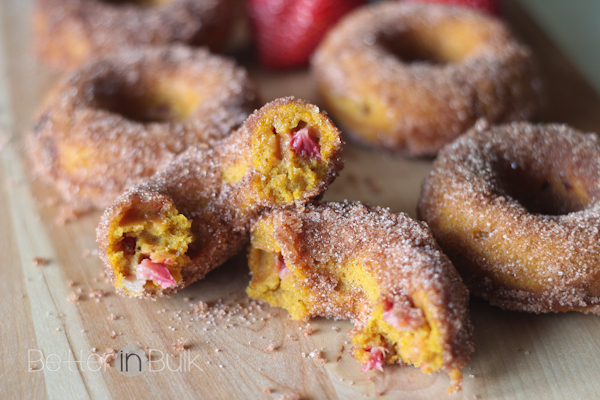 I will be making these pumpkin-strawberry donuts again and again….and I'm already brainstorming ways I can add pumpkin to some of my favorite savory dishes. (I'm currently itching to try adding a can of Libby’s Pumpkin to my next recipe of BBQ chicken in the crock pot!). 1 – Preheat oven to 350°. Lightly grease doughnut pan(s). 2 – In a large mixing bowl, beat together applesauce, oil, eggs, sugar, pumpkin, and spices. 3 – In a separate bowl, sift together flour, salt, and baking powder. Add dry ingredients to bowl with wet ingredients and stir gently until combined. Fold in strawberries. 4 – Spoon batter into greased doughnut pans. Fill approximately 3/4 full. Bake at 350° for about 24 minutes, or until a toothpick inserted at the center comes out clean. 5 – Let cool in the pan for a few minutes, then gently loosen the edges with a butter knife and remove to a cooling rack. 6 – Melt butter in a small bowl. Mix cinnamon and sugar in another small bowl. 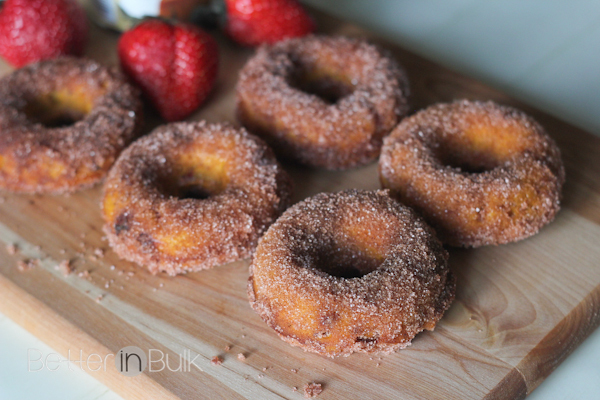 Dip or brush both sides of doughnuts in the butter and then the cinnamon sugar mixture, making sure that you cover all of the sides. 7 – Enjoy and bask in the amazing combination of strawberry and pumpkin! Not only does Pumpkin Can have ideas and inspiration to help you get cooking delicious meals and treats with pumpkin, but it also has info on how you could win a Vitamix blender! For more ideas and inspiration, visit Libby’s on Facebook, Libby’s on Twitter, and Libby’s on Pinterest. And be sure to check back here for more creative ways to use pumpkin all year! Yum, yum, yum! I really want to give these a try! Thank you for sharing at Merry Monday; I’ll be including your pumpkin doughnuts in my Features this coming week. We’d love to have you party with us again! What a yummy combo! Great treat for fall!~ Sharing! Thank you for sharing on Merry Monday! Hope to see ya next week! O my stars! these look absolutely mouth-watering. Visitng from Moonlight & Mason Jars Link Party and pinning! Thanks for sharing! Thank you! 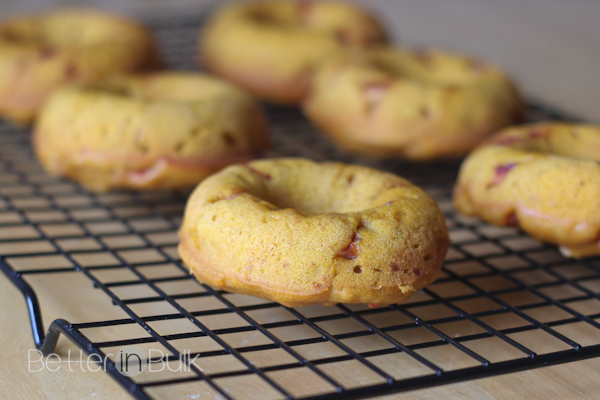 I never would have guessed that I’d be using pumpkin in so many baked goods…but it really is delicious and versatile…and in donuts it’s so moist! 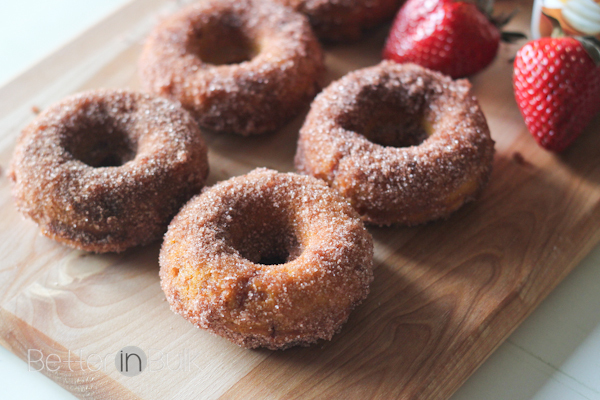 AFter seeing this delicious pumpkin doughnut recipe, I am convinced that I need to buy a doughnut pan so I can bake these! These look so delicious!! Thanks for sharing your recipe at Inspire Me Mondays! oh my looks so yummy!… i want some!!! I love Pumpkin bread, I wonder if I could find good ways to use pumpkin year round. Homemade donuts are awesome. This sounds like a great flavor. Pumpkin and strawberry? What a nice combination. This is the healthiest donuts I ever know. Oh my gosh. I think I need these donuts now. I never would’ve thought to pair up strawberries and pumpkins, but I’ll try almost anything at least once. Oh yum, those turned out perfectly! Definitely pinning. Mmmm, do those ever look delicious! I’ll take the whole stack! These donuts look AWESOME! If I made these, I’m afraid that I’d eat half the batch by myself! That sounds yummy and it looks yummy! Thanks for the recipe. These look really tasty! We don’t eat donuts much but I think i’ll try making these. Thanks for sharing! What a great recipe! I love homemade donuts. I love pumpkin anything and these loos so delicious. I didn’t know pumpkin had so many health benefits. That sounds so good! One day I’ll make my own donuts. I’m getting into baking. I’ve had pumpkin cookies before. I bet donuts taste even better! What A Great Combo I Must Make The Recipe Looks Yummy! 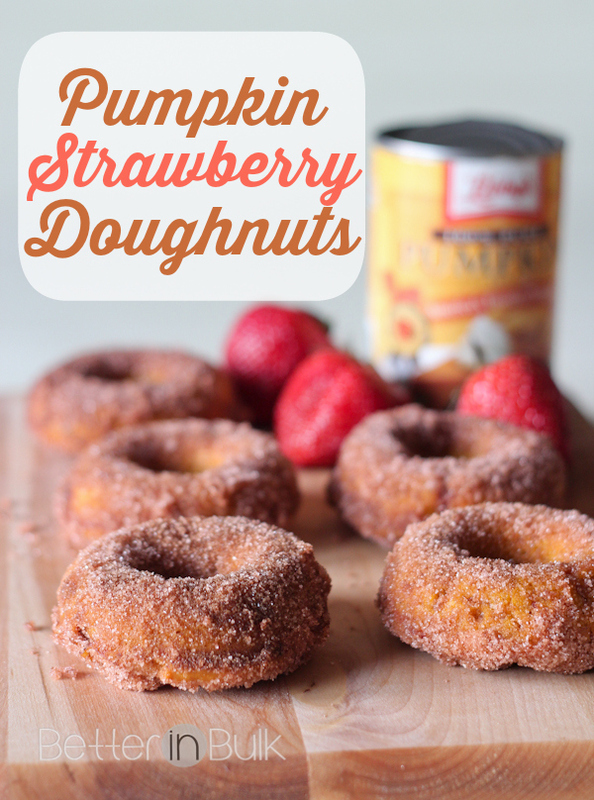 Although I am not a huge doughnut person, these do look delicious and I do like pumpkin! I like homemade donuts. We have a neighbor who makes them and we just inhale them!